High Quality Content by WIKIPEDIA articles! 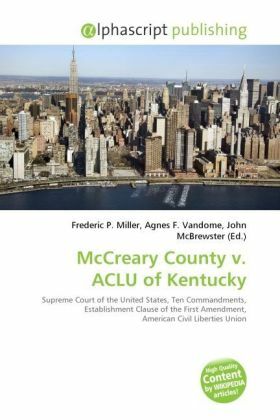 McCreary County v. ACLU of Kentucky, 545 U.S. 844, is a case which was argued before the Supreme Court of the United States on March 2, 2005. At issue is whether government-sponsored displays of the Ten Commandments in county courthouses violate the Establishment Clause of the First Amendment. In a suit brought by the American Civil Liberties Union of Kentucky, the United States Court of Appeals for the Sixth Circuit held that the displays in this case, a Ten Commandments display at the McCreary County courthouse in Whitley City, Kentucky were unconstitutional. The appeal from that decision, argued by Mathew Staver of Liberty Counsel, urged reformulation or abandonment of the "Lemon test" set forth in Lemon v. Kurtzman, which has been applied to religious displays on government property and to other Establishment Clause issues.